As I drove toward my hometown of Waterbury, Connecticut yesterday, while visiting my sister who now lives a few towns over, I searched for songs on the radio that would match the anticipation of eating my favorite pizza from Dominick and Pia’s–pizza I’ve been eating for over 30 years, pizza with the thinnest, crispiest crust, mellow tomato sauce, and I swear there must be some kind of magic unicorn dust sprinkled in with the cheese, because it makes all other pizza cheeses taste like Elmer’s Glue. What was even better than my anticipation of getting my mouth around a slice of that pizza, was the brainstorm of ideas that flooded my head about the perfect post I could write for my blog. I hadn’t intended to get pizza for the purpose of writing a post, but as I drove toward downtown Waterbury, the vision became clear. 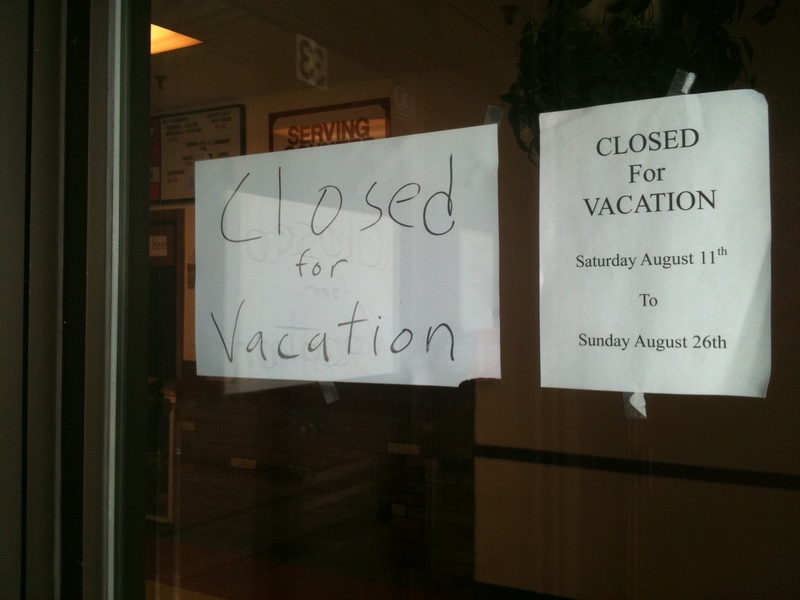 Only problem was, that when I stepped up to the doorway, I was met with this news….. I was going to write about how married couple,Dominick and Pia, have run their pizza shop for probably fifty years, and how I’d watch Dominick, who’s probably in his 80’s now, work quietly behind the counter, stretching the dough, ladling the sauce, sprinkling the cheese, almost as if in meditation–stretch, ladle, sprinkle…stretch, ladle, sprinkle, never speaking a word. I was going to write about Pia, who knows and warmly greets everyone who comes in the place, and still remembers me, even if there’s been a span of five years or more since I’ve been in. 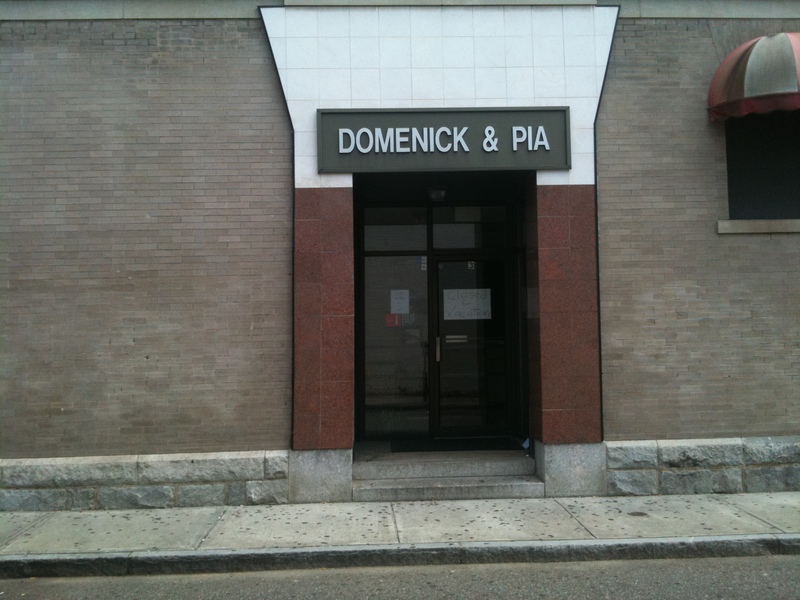 I was going to write about how Dominick and Pia’s was a great equalizing hub in downtown. About how everyone ate there–bankers, construction workers, office girls, black people, white people , Hispanic people, young people, old people. I was going to take photos of the mix of people waiting in line for that little slice of heaven. I was going to recall how Pia, in her strong, clipped tone and Italian accent, said people come from New York and beyond, have even heard about them in Italy, and go o Dominick and Pia’s to try a slice of what we Waterburians we’re lucky enough to grow up on. I was going to write about how Dominick and Pia’s pizza is the cheese that is the glue that held, and still holds, us all together. I was going to write about how I pray that their son will take over the business when Dominick and Pia finally decide to take the retirement they so deserve after working tirelessly for so many years, so I can selfishly continue to have the ability to eat their pizza, and have my daughters eat their pizza for years to come. I was going to write about a slice of pizza that brings tears to your eyes for all of it’s simple goodness, and how that is what life is all about, and how as I write this I am imagining a scene inside of Dominick and Pia’s much like the final scene of It’s A Wonderful Life, where we all realize what’s important–food that feeds our soul, people that make us feel special, all of us different, but the same, together for one purpose, even if it only lasts as long as it takes to down a warm slice of the greatest pizza on earth. Yeah, this post coulda’ been a contender. Good one, Wendy. Reminded me of my first taste of pizza. Mmmmmm, sounds good, too, Myrna. Thanks for reading and sharing your memory. Oh my god – I so want a piece of pizza right now. Can you get good pizza in Bangkok? :) Thanks for reading the post, Lisa. I loved this post when I first read it. Forgot to comment, though. I love your blog….